Fewer than one in ten meetings between MPs and stakeholder groups on issues of policy are with public affairs agencies, new research has indicated. 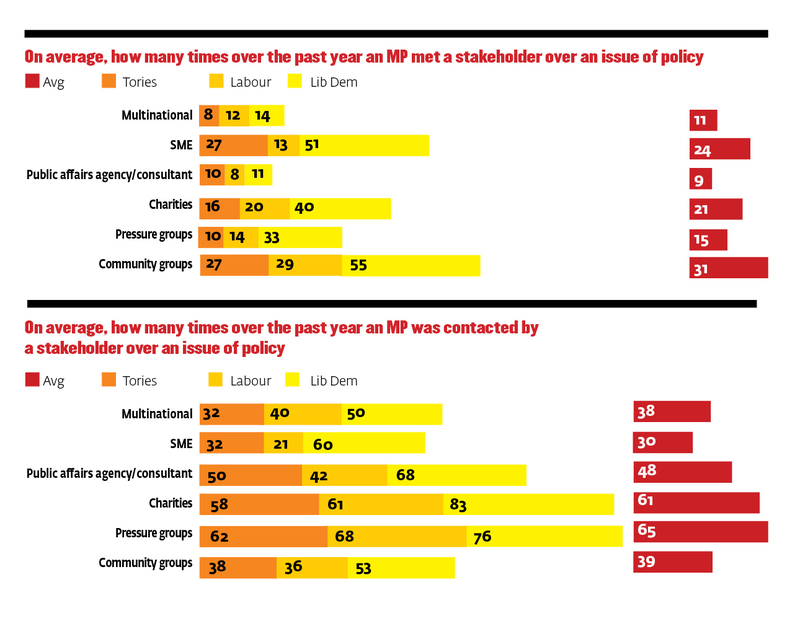 A Populus and PRWeek poll of 127 MPs has shown that, on average, parliamentarians met public affairs agencies and consultants just nine times in a year – the lowest of all the organisations included in the survey. The survey found that on an average annual basis, MPs were taking 21 meetings with charities, 15 with pressure groups, 11 with multinational corporations and 24 with SMEs. But though they have a relatively low rate of meeting MPs, these agencies have the third highest level of making contact with parliamentarians over issues of policy. Acknowledging that the role of such consultancies is often organising, rather than attending, such meetings, Westminster Advisers head Dominic Church nonetheless claims the figures speak of poor practice among some agencies. "Many are not forensic and will focus on outputs rather than outcomes. A rule of thumb is that often typically only 10 people in Parliament will have real sway over any given issue and the scattergun approach is not effective." One communications lead at a major multinational corporate says the figures also point to a trend in the growing influence of heavyweight in-house teams. "For a business such as ours," they say, "we are finding a lesser need for public affairs agencies to do the heavy lifting as we have really good contacts with the majority of our stakeholders in Westminster and Whitehall." Whoever is doing the lobbying, it seems that the Liberal Democrats are a major target. The study revealed that the party’s MPs had been each contacted by interested parties 390 times in a year and met them 204 times – far higher in both cases than either the Tories or Labour. While many point to the party historically being more open to engagement, former Edelman public affairs head and founder of Corporate Reputation Consulting Chris Rumfitt claims lobbying groups are reacting to the party’s suprise success in the last election. "Things are uncertain but many polls are currently pointing towards a hung parliament, with the Liberal Democrats having a good chance of being part of the Government. In the previous electoral cycle people who didn’t take the Liberal Demcorat manifesto seriously got their fingers burnt." The results also appear to add weight to industry criticisms of the Government's forthcoming lobbying register, which will only cover work by public affairs agencies and consultants. Acknowledging the lobbying register will only record contact with ministers and permanent secretaries rather than all MPs, APPC chairman Michael Burrell says the findings still "reinforce that the government register is inadequate and offers only a very limited step forward."